BOTOX® injections are used to treat facial wrinkles, restoring a more youthful, rested appearance. We are born with dynamic wrinkles, which are associated with the muscles we use for facial expression. As we continuously use our facial muscles to smile, laugh and squint, mild wrinkles appear when we are young, but they become deeper and more noticeable as we grow older. The most common areas where we develop dynamic wrinkles around the lips, the corners of the eyelids (where the wrinkles are known as crows’ feet), between the eyebrows, and on the forehead. 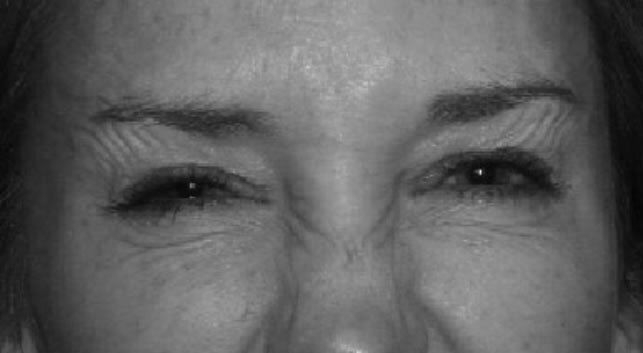 These wrinkles often make people look older and more tired than they actually are. BOTOX can be used to treat these dynamic wrinkles and make them less noticeable. 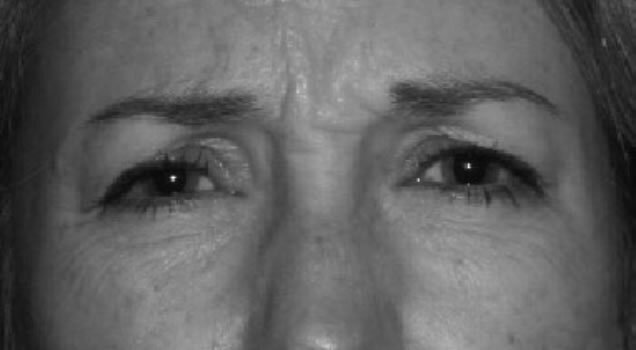 Wrinkles in the forehead are significantly reduced after treatment, even when the patient contracts her facial muscles. Crèpe-paper wrinkles are caused by sun exposure and aging. As we age or are repeatedly exposed to the sun, collagen (the protein substance found just beneath and within the deep layers of the skin) begins to thin, causing facial skin to stretch and sag. Unfortunately, BOTOX cannot treat crèpe-paper wrinkles. However, there are other procedures that may be used to reduce the appearance of crèpe-paper wrinkles. Botulinum toxin (brand name BOTOX®) is extracted from the bacteria Clostridia botulinum. For years it has been used as a nonsurgical treatment for uncontrollable facial spasms and disorders of the eye (such as misaligned eyes). Now it is used as a safe and effective way to reduce facial wrinkles without surgery. BOTOX is targeted directly at the facial muscles that are causing dynamic wrinkles to form. The BOTOX protein injection blocks transmission from the nerve ending to the muscle. As a result, the muscle relaxes, significantly reducing the appearance of wrinkles and muscles on the skin above that muscle. This blocking effect on the nerves usually lasts an average of three to six months, at which time the muscle regains movement and wrinkles reappear. Using a very fine needle, your doctor injects the BOTOX directly into the targeted facial muscles. A topical anesthetic cream may be applied to your skin to decrease the sensation of the injection; you should discuss this option with your doctor beforehand. BOTOX treatments take only a few minutes and are given during a typical office visit. You should be able to return to your normal activities immediately. The best candidates for BOTOX treatments are people who are physically healthy, with no history of neuromuscular diseases (such as multiple sclerosis or myasthenia gravis), who are not pregnant or nursing, and who are at least 18 years old. You should inform your doctor of your medical history and all medications, vitamins and/or herbal supplements you are currently taking before having BOTOX treatments. It is important to remember that the level of improvement in the appearance of wrinkles after BOTOX treatments can vary among patients. Some people respond better to BOTOX than others. Occasionally there is little improvement and another form of treatment may be recommended. It is important to discuss your situation and your expectations with your doctor. BOTOX is a toxin and can be potent in high concentrations. Only small, diluted amounts of BOTOX are used in treatments to reduce facial wrinkles. The most common side effects are headache and temporary redness or bruising of the skin at the injection site. Bruising appears to be more common in patients taking aspirin or blood-thinning medicines. These medicines should be avoided if possible for a few days before treatment. You should inform your doctor of all medications you are currently taking before having BOTOX treatments. Occasionally, some people might experience temporary eye irritation or tearing after BOTOX treatments. More serious complications are rare but possible. There is a chance that non-targeted muscles could be affected and weakened. This could cause drooping of the eyelid (ptosis) if BOTOX seeps below the eyebrow and into the muscle that controls eyelid function. Though the effect is not permanent and will eventually go away as the BOTOX wears off, drooping eyelids may temporarily obstruct your ability to see. Sit upright and do not lie down for at least four hours after treatment. Having an ophthalmologist perform your BOTOX treatment can help to ensure the safety of your eyes and your vision. Many ophthalmologists have been on the forefront of Botox treatment. It has been used for over 10 years in ophthalmology to treat involuntary spasms of the eyes and other facial spasm disorders. As an eye care specialist, your ophthalmologist is most familiar with all aspects of your eyes, including the muscles and structures surrounding them.